I've seen various references on the web for generating Elliptic Curve KeyPairs in Java, and the two most commonly referenced examples (unsurprisingly) use the JDK default provider and BouncyCastle. In summary, the BouncyCastle provider supports all three algorithm names, EC, ECDSA and ECDH while the JDK default provider supports only EC. Why the discrepancy? Is there any meaningful difference in the resulting keys used in any of these approaches? Bottom line: Yes, keys are interchangeable between ECDH and ECDSA. 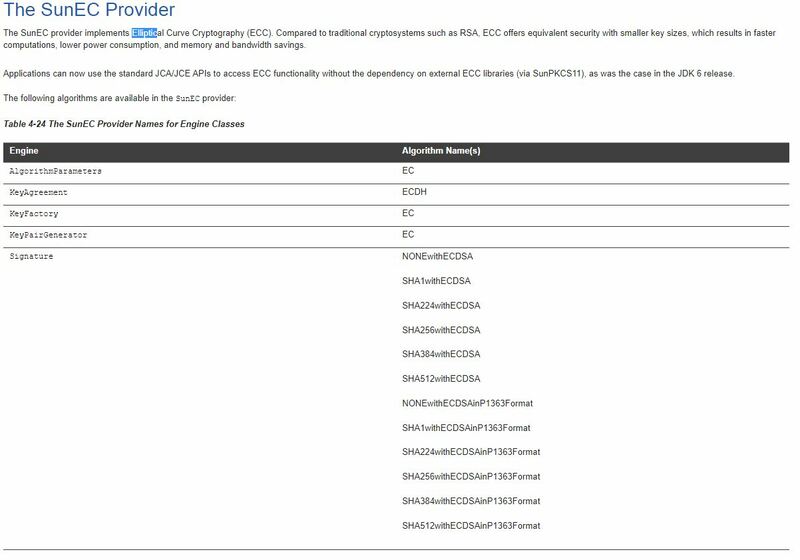 Having dug through the Oracle documentation, I'm too lazy to go through Bouncy Castle too, but I would assume that EC, ECDH and ECDSA are all aliases to the same thing, put there to avoid confusion. Not the answer you're looking for? Browse other questions tagged java key-generation ecc or ask your own question. What password-based encryption to use with standard Java 6? ECC Brainpool Standard Curves and Curve Generation with Bouncy Castle which seed to use? Is it safe for both client and server to use the same keypair in CurveZMQ? Can be used ECDH with static public key and parameters?